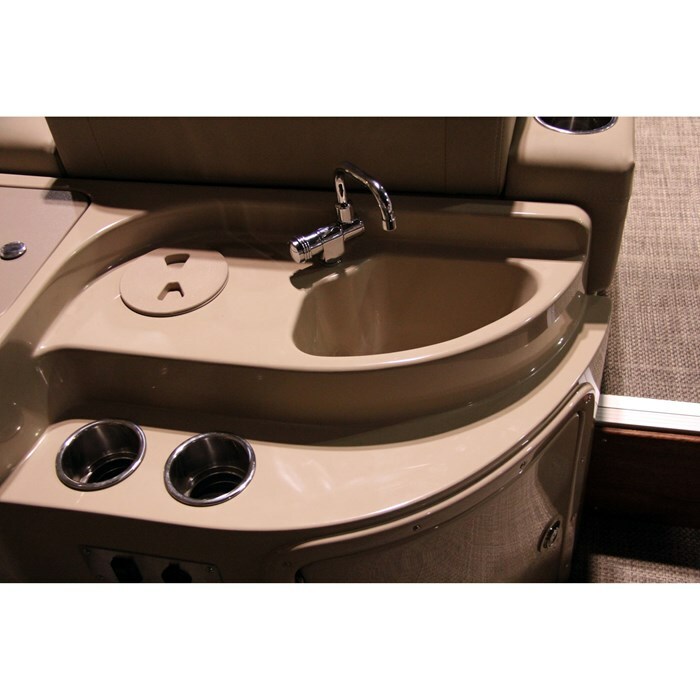 The permutations and combinations of sizes, models, trim levels, styles and options of pontoon boats available from this upscale Elkhart, Indiana builder is almost mind boggling. 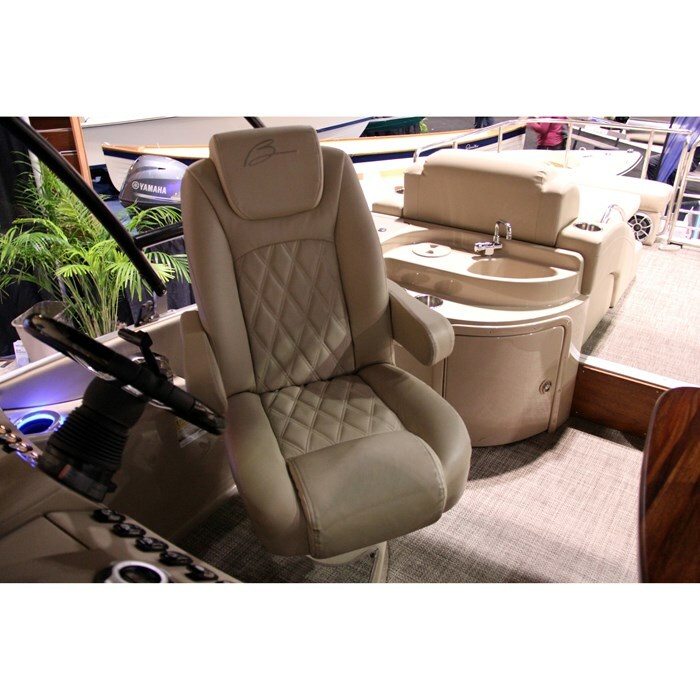 To wit, for 2014, Bennington’s website shows 117 available floorplan combinations derived from the four main model Series (Q, R, G, S), six basic floorplan configurations, in nine boat lengths from seventeen to twenty-eight feet, mostly outboard powered and some with sterndrive power. Add to the above some seven choices of panel & canvas colours, six graphics choices, standard or curved bimini, hybrid, Sport Tower, or Sport Arch tops, plus other enclosure options, plus a huge selection of available performance upgrades plus umpteen helm, navigation, galley, lighting, fishing, seating, entertainment, upholstery, lifestyle and just plain “nice to have” available accessories, and I can’t imagine how any two identical Bennington’s ever leave the factory, let alone appear on the same body of water. Well add one more upgrade option package for 2014 available on the already upscale 2575 QCW I/O (inboard-outboard or sterndrive) model and call it the StanCraft Mahogany Edition and you have a pontoon boat that looks like no other on the water today. What this option package adds to the luxury features already present in this model includes deep brown mahogany planking with chrome accents to the outside panels of the boat plus mahogany accents throughout the interior including the trapezoidal table serving the rear portside lounge, the dash bezel, toe kicks, portable cupholders, and chaise lounge armrest accents. The result is unique, startling refreshing, and oh so attention grabbing. Let’s explore the standard features of the 2575 QCW I/O to which this new option package is added. Perhaps most noticeable and somewhat unusual but possibly oh so desirable about this model are the two stern-facing, what Bennington calls, super lounges with enhanced headrests and grab handles located just ahead of the new restyled fibreglass swim platform with stainless steel telescoping boarding ladder. Within the starboard super lounge is a pop-up privacy enclosure. In addition to these two lounges are three more what Bennington calls wide berth chaise lounges each with a fold-down armrest with integrated cupholder and with storage and ventilation beneath: one each of these lounges in the bow section and one L-shaped one on the port side opposite the helm with the aforementioned trapezoidal table, normally in espresso teak, but mahogany with this special option package. Continuing with the interior, all upholstery is Bennington’s Icon™ Soft-Touch pillow top Q with diamond stitching vinyl. Seat bases are composite Duraframe. 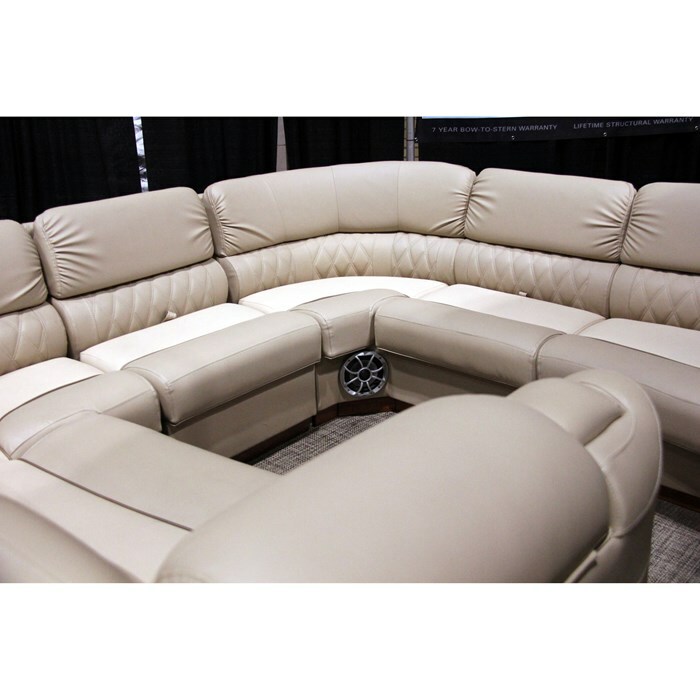 A self-draining bench seat cooler is new for 2014 as is a restyled Pure-Comfort reclining helm chair with integrated headrest. Seat hinges are powder coated and cupholders are stainless steel. 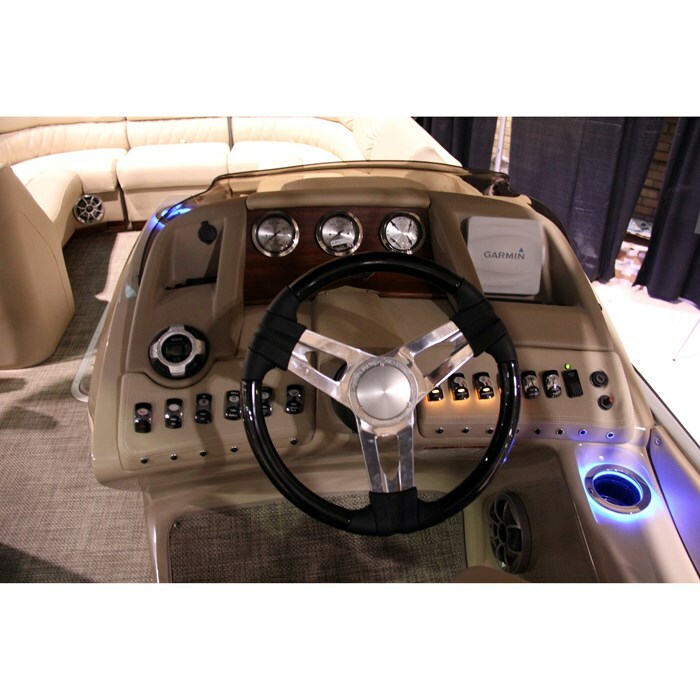 The one-piece fibreglass helm console with storage includes a foot rest, tilt steering wheel, custom Sterling sterndrive gauge package, Garmin Echo 100 fish/depth graph, and Sony M6 stereo with dash-mounted remote, USB Port, and MP3 recess. 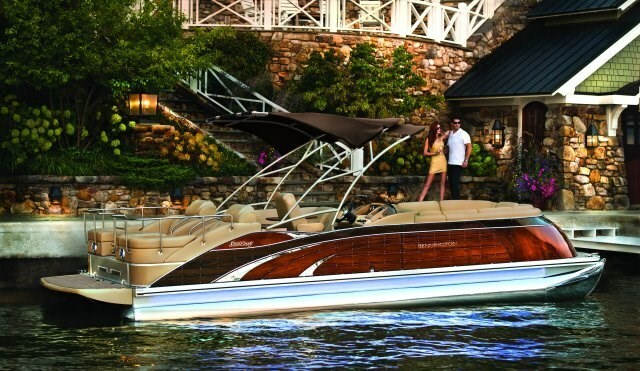 On the exterior, standard features include Bennington’s ESP (Elliptical Sport Package) for greater performance which includes two 25" diameter pontoons with performance foils, a patented 32" center elliptical tube with lifting strakes, SeaStar® hydraulic steering and an underdeck waveshield. New for 2014 is a fibreglass compound radius curved extended bow. The transom is of composite material. The housings of the standard LED docking lights are stainless steel as are the cleats, rub rail, stern gate and rails, corner castings, removable ski pylon, and even the deck bolts. 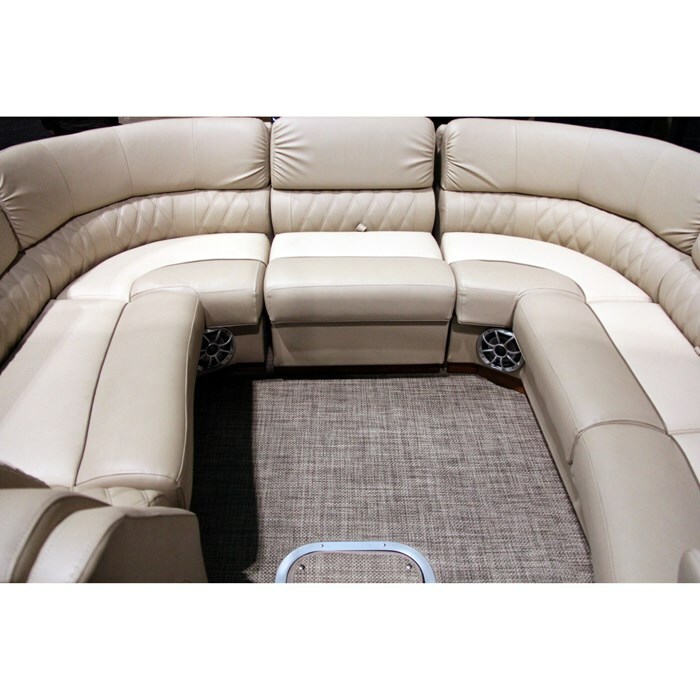 A quick release ten-foot bimini top with boot is standard. 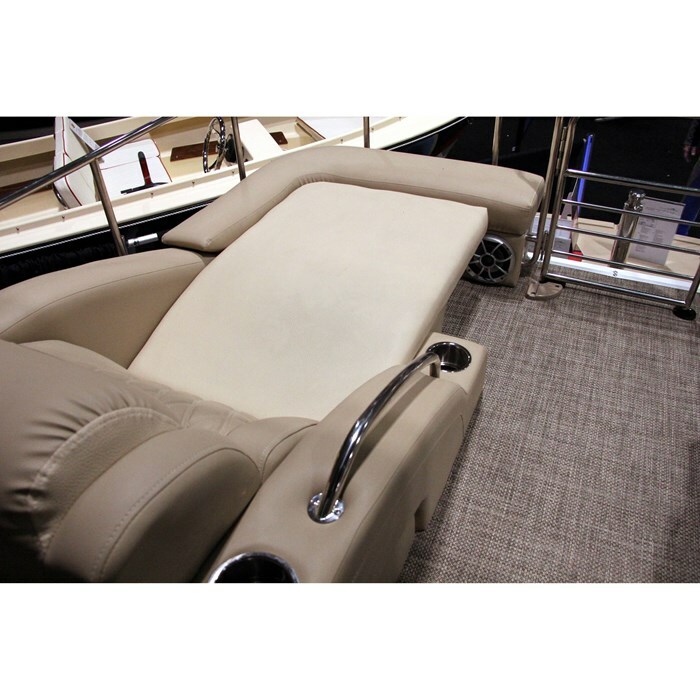 Notable options selected from the vast choice of available items include a huge selection of varied choices of flooring in different areas of the boat from fixed or snap-in carpeting to Aqua Teak or Woven Teak overlay or inlay, Seagrass, or vinyl. Choose a bow gate seat, a coffee table, or perhaps an ottoman with cooler or an extra-wide recliner upgrade or the new for 2014 bow storage doors. At the helm console, a complete elevated helm assembly is new for 2014 as are illuminated Wet Sound speaker upgrades for Sony’s WetSounds Super Radio system. Various Garmin electronics upgrades are available plus other stereo upgrades. Various galley locations and inclusions are available as are Blue Ice LED illumination for the bimini, cupholders, sides and underwater. You may want a porta-potti and a washdown and choose from a wide selection of various camper enclosures and coverings. Single sterndrive power from either Volvo or MerCruiser is available: 270 through 380 horsepower from Volvo, 260 through 430 horsepower from MerCruiser. 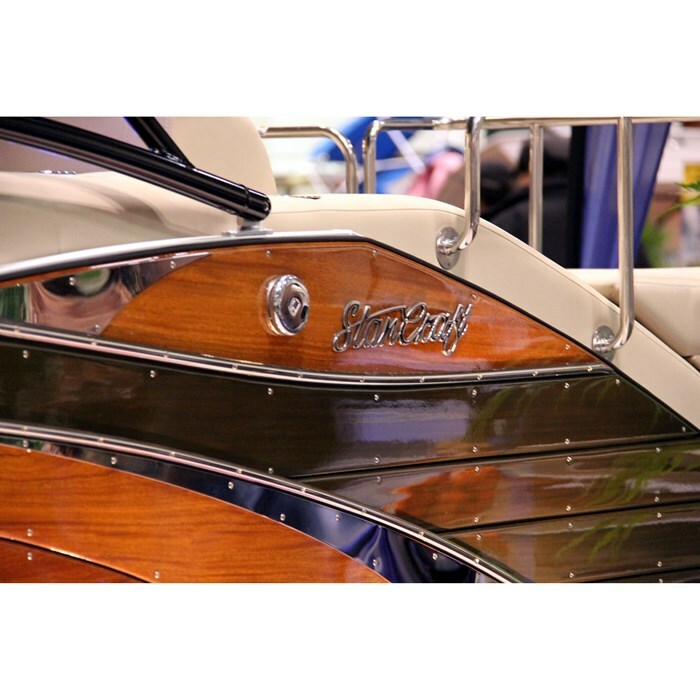 However you outfit your Bennington, if you go for the StanCraft Mahogany Edition, be prepared for a lot of attention and to answer a lot of questions. This one really stands out from all the rest.